Unless contractually obliged many vendors will not give up the TMs, which are your key to moving to another provider, unless you first pay for that privilege. It’s not unlike having to pay a photographer for the source images. 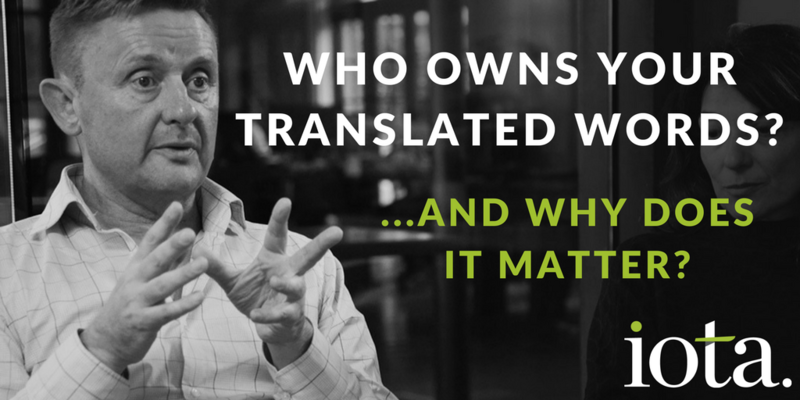 Cloud-based translation providers are another matter of course. Your words belong to them and are often used to pre-translate content for other buyers, who may even be your competitors. There isn’t much you can do about that, it’s the business model they use to try to make money. It’s always best to have a chat with your provider in advance to avoid any end of project disharmony. Any ambiguity can be clarified via a services agreement. Localisation relationships can go bad for a variety of reasons, many of which are not translation quality based. You really don’t want to end up in a situation where your TMs, which are vital to the financial efficiency of the next project you do, are being held hostage by a provider who knows they are about to be “jilted”. At Iota LS, our policy is to deliver TMs at the end of each and every project. They’re your words, to do as you please with. Though hopefully, you’ll come back to us.